I'm doing a touch-landing at home today and tomorrow before I'm off again on my next adventure--this one not fibre related, but an adventure none the less. I'm dashing around like a mad thing, trying to get things ready for the next trip, organizing the household for another bout of Momlessness, and generally trying to keep on top of March. 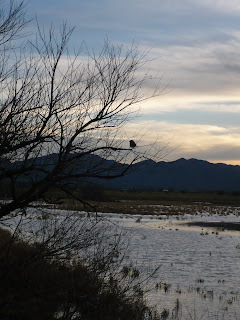 Not a lot of time to blog, but I'd thought I'd give you a quick glimpse of my trip. Bisbee and the class were amazing. Once again, a room full of people as passionate about string as I am. Awesome, smart, funny, talented people at that. Simply amazing. And waaaay too much fun! 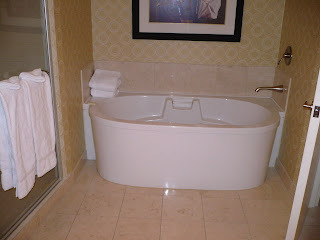 ...and the bathtub! I very nearly never made it to Bisbee. I could have happily lived the rest of my life in that tub! But I did make it to Bisbee. 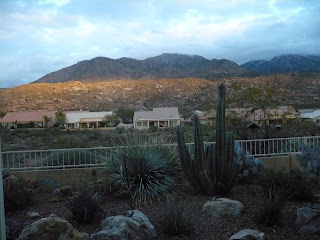 Or rather, to Tucson, where I picked up by Joan Ruane, who was my hostess for the weekend. 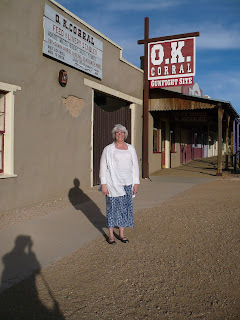 Joan is a fantastic spinner, and a warm and generous hostess, who even humored my request to stop at Tombstone to get my picture taken at the OK Corral. ...which would not be complete without a class dog! 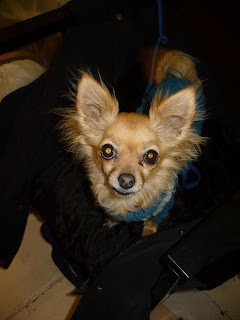 Meet Ladybug, the constant companion of one of the participants. Ladybug sat quietly and patiently while I gabbled on about the intricacies of twist, and was always waiting with a cheerful wag and a lick when it was time for a break. Bisbee itself is a charming little community perched on hilltops and steep slopes, all surrounding a now-defunct copper pit mine. 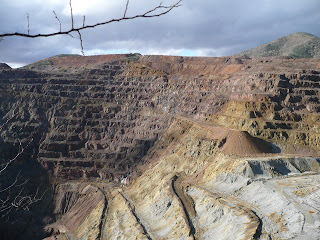 The mine is alarmingly beautiful, since, as one of my students said, it's developed a patina. We passed it each morning on our way into the studio and every morning, I caught my breath at the colors and light. Stunning. ...but I think I coped very well. Just breathtaking--I can't even imagine waking up to that kind of beauty every morning. 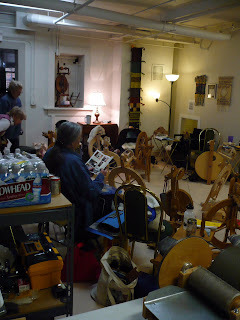 Elaine is an amazing weaver and has a studio away from this window, which I think is why she can be so productive. If I had this to stare at, I would never get anything done! 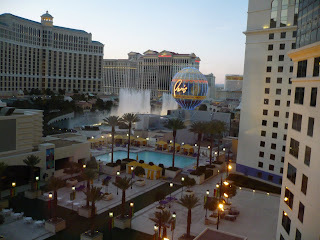 ...where I had managed to Hotwire myself into Caesar's Palace, where I was upgraded to a honeymoon suite. 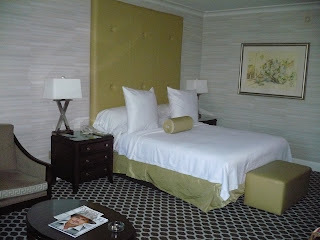 With so much to do in Vegas, I mostly just wanted to crawl into this gigantic bed and sleep. But I didn't. Most of the shows were dark because it was mid-week, but there was plenty of shopping and fine dining. And a Jacuzzi tub in the bathroom. I got back to Edmonton, then back home. And I have been on the run since I got off the plane. The next two weeks will be a blur, then I'm off to Fort St. John to give my Spinning Super Socks workshop and a Don't Throw That Away seminar. Looking forward to more adventures. And more snapshots! I am a fibre artist and educator living with Rheumatoid Arthritis. These are the tales of my work, my travels, and my fight with chronic illness.